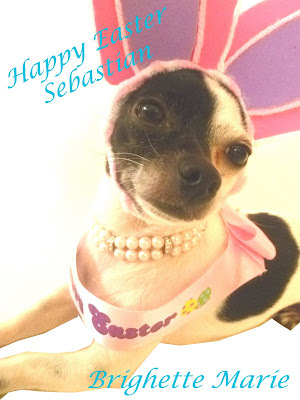 Happy Easter from Sebastian and his NEW friend Brighette!! Sebastian and Brighette teamed up to bring you two super cute tutorials on bunny ears!! Chenille stems, fabri-tac glue, super cute fabric, fur, and a camera! Take one stem (or two for big dogs) and wrap it around dog's head. It should be snug. 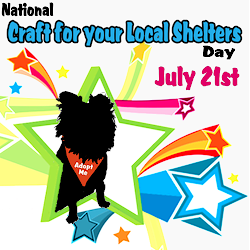 Twist it in place and make sure the wires are facing away from your dog at all times! Fold two stems in half for the ears (make longer for bigger dogs by twisting two stems together and then folding in half). Then twist the ends around the head piece and cut off any extra wire. Trace the ears on the main peace of fabric and add a quarter inch all the way around (including the bottom) to allow a 1/4 inch inseam. Cut out and trace two more pieces. You'll need a total of 4 pieces to cover the front and back. Then sew them right sides together leaving the bottoms open. Slip them onto each bunny ear and then adjust stems inside to your liking. Glue the bottom of the fabric ear to the head piece to hold it in place. Lightly glue on a small piece of fabric in the middle of each ear (see white portion below). Then hide all the unattractive sightings by gluing a strip of fur on top! Here is Sebastian's big sister taking a break from her rawhide to model the finished product! Does anything say "Happy Easter" more than a good pair of bunny ears? Brighette and I love to make this bunny ears and she is very happy to have a new friend. This was very cool proyect! Oh cute! I'm going to have to try this! Your version looks ever so much more comfortable for our canine companions than the ones we find in the store for kids. Thanks for sharing. Very cute post.. 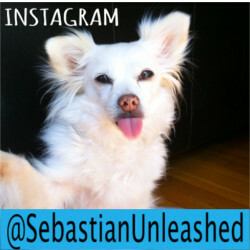 I see that Sebastian is a famous pup. His picture is in April addition of Fido..very cute. Thanks, I see me wearing bunny ears in the very near future. Oh my goodness, how cute is that! That is too adorable. I may have to wait until my pups bigger he would just chew it up. I may have to try this. I have fabric and pipe cleaners and... what's that Opie... Oh I used to have fabric and pipe cleaners. Kirby said "I DO NOT WEAR BUNNY EARS!" Oh well. We already love your blog so its ok :) And you already know how much we love the tie and collar info! Stopping by from Meet and Greet Party!